The United States Mint manufactured Trade silver dollars minted from 1873 to 1885. The United States government intention was to issue a coin that would compete with the dollar-sized silver coins of other countries that were trading with Asia. Originally, they were legal tender in the United States, but when silver prices declined Congress repealed the provision and authorized the United States Treasury to limit coinage production for export only. Many of these coins were counter stamped with Oriental characters, known as chop marks. These were placed on the coins by Chinese merchants that already verified the authenticity and fineness of the coin. Therefore, if they saw the coin again, they would not have to test it for its authenticity and precious metal content. In the early 1870s The Treasury Department decided to create a special coin for international commerce. It was initially called the Commercial Dollar and then finally the name was changed to the Trade Dollar. A majority of them were minted at the San Francisco mint and were used in servicing trade with China. The denomination denoted on the coin wasn't as important as the silver contained within the coin. It's the silver content of the coin that gave it value in international commerce. It was first minted in 1873 and the obverse Is designed by Chief Engraver William Barber. It depicts Miss Liberty seated on a bale of merchandise facing to the left. The reverse features an eagle perched on an olive branch and arrows. Additionally, it had the inscriptions "420 GRAINS. 900 FINE." that indicated to foreign merchants the amount and fineness of silver contained in the coin. Most coin collectors only obtain one example of a Trade silver dollar for their type collection. Advanced numismatists may try to assemble a date-mint collection or a more affordable date collection. Over the long-term, the market has been fairly stable. If you want top dollar for your Trade Silver Dollars, you need to sort them and organize them so the dealer can quickly see what you have. The following Trade silver dollars in any condition, are worth considerably more than common one that have high mintages. As such, these coins are frequently counterfeit or altered from common Trade dollars. Therefore, before you start celebrating your new found fortune, have the coin authenticated by a reputable coin dealer or third party grading service. ^ = Only 10 Trade dollars dated 1884 and only 5 Trade dollars dated 1885 are known to exist. These coins are extremely rare and many fakes and forgeries are known to exist. Trade silver dollars were produced at three different mints: Philadelphia (no mint mark), Carson City (CC) and San Francisco (S). 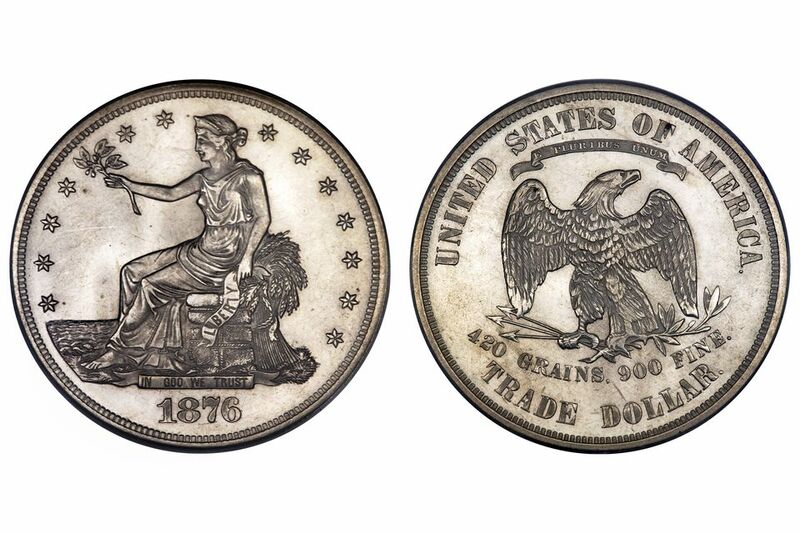 As illustrated in the picture link below, the mint mark is located on the reverse of the coin, near the bottom just above the words "TRADE DOLLAR". when determining the value of a coin, you must consider if you are buying the coin for your collection or selling it in order to liquidate your coin. The buy price (what you can expect to pay to a dealer to purchase the coin) and sell value (what you can expect a dealer to pay to you if you sell the coin). The first column lists the date and mint mark (see the photo above) followed by the buy price and the sell value for an average circulated Trade Silver Dollar. The next two columns list the buy price and the sell value for an average uncirculated. These are approximate retail prices and wholesale values. The actual offer you receive from a particular coin dealer will vary depending on the actual grade of the coin and a number of other factors that determine its worth. The coins listed below that have the "Proof" designation are only available in Proof. "^" = Does not include the extremely rare 1884 and 1885 issue.